Red roses have a graceful appearance which shall drive the people around them go crazy. This basket depicts beauty and love. Send this basket of love and beauty to your sweetheart who resides far away from you. Flowers are the best gift that can be given to your loved ones. 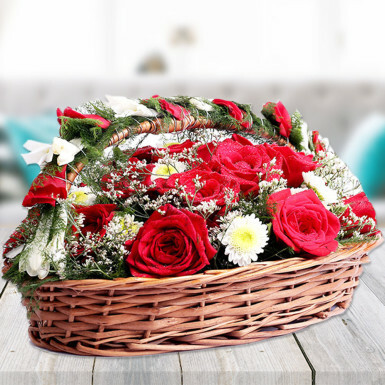 To convey your deep love offer this basket of love to your crush. You can also gift this bouquet on occasions like birthday, valentine’s day, mother’s day, rose day, friendship day, date night, get together, congratulations and many more.